Research Methodology Lecture Series (1st Edition) presents the major methodological approaches of scientific inquiry used by researchers studying all aspects of crime, criminals, and the criminal justice system. The text begins by introducing readers to the basic concepts associated with criminal justice-related research, including a brief introduction to various research methods, the logic behind research, causation, the steps involved in criminal justice research, and ethical considerations associated with conducting criminal justice research. Following this introduction, the topics of measurement and sampling are explored in depth and provide the reader with detailed information on validity and reliability, levels of measurement, and specific types of probability and non-probability sampling techniques. The book concludes by examining the specific research designs used in contemporary research, including experiments, surveys, field research, unobtrusive methods, secondary data analysis, and evaluation research. 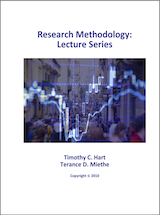 Click the button below to purchase Research Methodology Lecture Series (1st Ed. ).